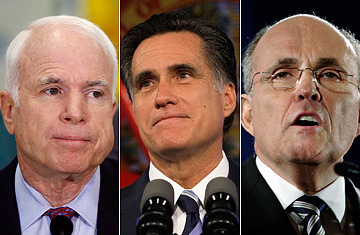 Is Romney Fighting the Last War? Last summer, former New York City Mayor Rudy Giuliani took time out of a GOP debate to defend John McCain: "I happen to be a very big admirer of Senator McCain and I can tell you quite honestly that if I weren't running for President I would be here supporting him." Pundits speculated that the praise was simply a kind word for the man whose campaign had recently exploded, plagued by debt and defections. Privately, McCain advisers wondered if Giuliani was playing nice in order to secure McCain's endorsement after he dropped out of the race. But this week it was Giuliani who dropped out of the race and endorsed McCain, praising him as an "American hero." The endorsement was a reflection of the authentic respect McCain and Giuliani have for each other. But that's not all the two candidates share. The endorsement deal was solidifed when both campaigns stayed at the Deerfield Hilton in Florida, following the Republican debate in Boca Raton on January 24. The two campaigns' staff mingled easily over drinks. Acknowledging that his candidate was not likely to survive a defeat in Florida, a Giuliani aide approached one of the McCain senior staffers. Come Wednesday, he said, "Just tell us what want us to do  we've got to stop him." "Him," of course, is Mitt Romney, the candidate who seems to be uniting his Republican rivals almost as much as Hillary Clinton. "The degree to which campaigns' personal dislike for Mitt Romney has played a part in this campaign cannot be underestimated," says an adviser to one of those rival campaigns. While sharp words have been exchanged between practically every Republican candidate at one point or another on the campaign trail, the aversion to Romney seems to go beyond mere policy disagreements. It's also a suspicion of what they see is his hypocrisy and essential phoniness  what one former staffer for Fred Thompson called Romney's "wholesale reinvention." The Romney campaign doesn't pretend the sour attitude toward its candidate doesn't exist. But chief counselor Ben Ginsberg insists echoing one of the campaign's main themes  the attitude stems largely from the fact that Romney is "the outsider candidate. He's not from Washington and he's going to change Washington. He's not part of their club." At times, this apparent rancor among the other candidates toward Romney has seemed like a schoolyard pact  for example, in the many snarky comments aimed at Romney during the Republican debate on Jan. 5, just before the New Hampshire primary. The campaigns have denied there's any political collusion going on; they insist all of them simply feel the same way about Romney.